This week's theme for #SundaySupper is PIE! You know it is pie month, as we've celebrated here at Our Good Life in a couple of different ways! I love hand pies, and have a board on Pinterest dedicated to them! I make the filling for a shepherd's pie and encase it into puff pastry that is sealed around the edges with a fork. Sometimes the filling leaks through, but that just makes it more delicious! Instead of putting the mashed potatoes in the filling, I serve them on the side. These neat mashed potatoes will be featured on the blog on March 6. Come and check them out! Shepherd's Pie in a hand pie form. Perfect for lunch boxes or dinner on the go! Preheat oven to 400. Bring pastry to room temperature. Cook ground beef and onion together, season to taste. Drain, add in vegetables. Cook until warm. Add in gravy, Worcestershire sauce. heat. Roll out the pastry and cut into an even number of same size squares or rectangles. Place filling in the center of the pastry square. Make an egg wash of egg and water, brush edges of the bottom pastry with egg wash. Lay a second square of pastry on top, and bind the edges together with a fork. Brush lightly with egg wash. Bake 10 minutes or until pastry is a golden brown. Let cool before serving. I love Shepherd's Pie. Never thought to turn it into a finger food! Nice job, Terri. Don't you just love puff pastry? It's a great idea to serve the potatoes on the side too! Using puff pastry makes these a breeze to put together! These hand pies would be a hit at my house!! Love this! 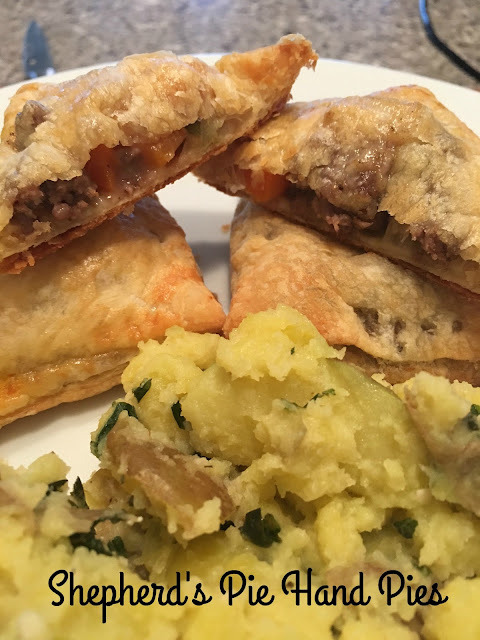 Shepherd's pie is my all time favorite comfort food and to stuff it in a hand pie is genius!!!! Oh my goodness, the only thing better than pie is miniature, individual pies!! What a fabulous idea. These are so cute, and look so yummy. Glad to have found you (and did so via Alana Kellogg on Facebook). Love the idea of making Shepherd's Pie "portable," makes it perfect for a St. Patrick's Day party! I love these kind of hand pies!